As part of our spring cleaning and redecorating, I have been spending more time redoing our master bedroom. Not only do we want a comfortable bedroom, but one that is functional enough for us to read or cuddle together while we watch movies on our projector. While repainting our bedroom is on my agenda for the next few weeks, my goal now is making our bed more comfortable. After getting our new Novosbed mattress, I knew we needed some new linens and blankets for the bed. Just as I was starting my search for the perfect king size blanket, we were approached by American Blanket Company, asking if we wanted to review one of their high quality blankets. Once I saw their website and picked out a color, I was excited for my brand new blanket to arrive! Looking for a super soft, fleece blanket for your bed? If so, we think you will love blankets from the American Blanket Company. These are hand crafted in a historic textile mill in Fall River, Massachusetts; unlike other companies, they don’t cut corners, making blankets that are made to last a lifetime. and are guaranteed not to shed or pill. To truly spoil yourself, consider trying their Luster Loft Fleece blanket, which may (from my experience) very well be the softest fleece blanket in the world. 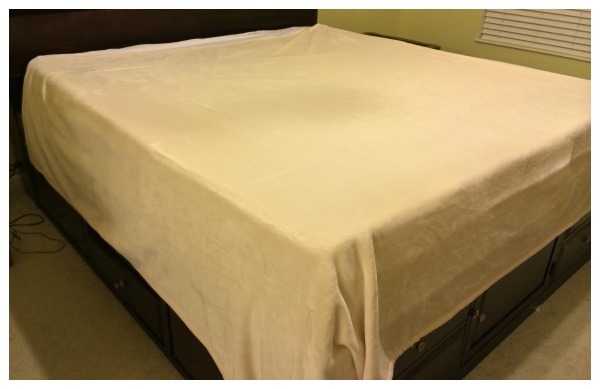 This quality, luxury blanket has a beautiful luster finish and stays soft even after washing. These blankets are also safe for your washer and dryer, allowing you to truly enjoy these wonderful blankets! 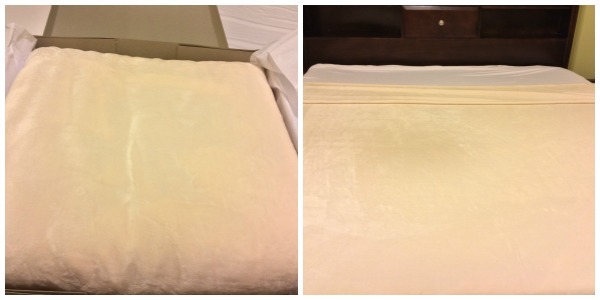 When my Luster Loft fleece blanket first arrived, I was almost too scared to open it. You see, it came in the most beautiful gift box and I really didn’t want to open it. My husband had to actually take the blanket from me and open it so that I would take out the blanket. Once I took the top off, however, I immediately fell in love with the blanket. Not only was the most beautiful light beige color, but may very well be the softest blanket I have ever touched my life. I cuddled in the blanket that night and enjoyed the warmth that came from this super soft blanket. After I had tried out this blanket, I was hooked! So far, based on my own experience with the American Blanket Company, I am happy to give their Luster Loft Fleece Blanket an A+ rating! Want to purchase one of these wonderful blankets for yourself? 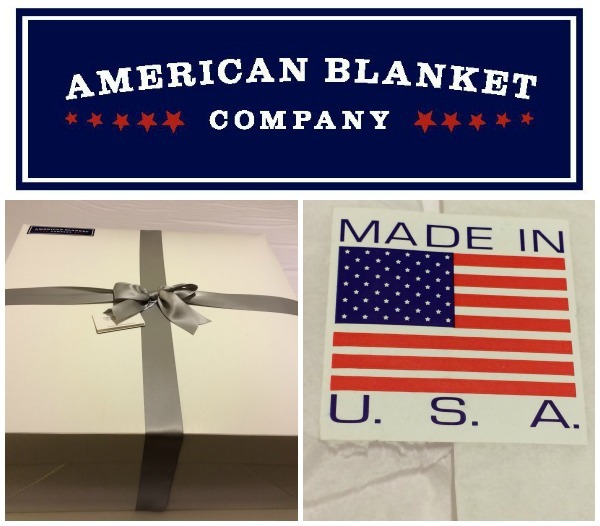 You can buy a Luster Loft Fleece Blanket from the American Blanket Company Website for as low as $59. Currently, these blankets are available in nine colors and three sizes – twin, queen, and king. You can even get them monogrammed to personalize them to your own family. After you have tried one of these wonderful blankets, I think you will never want to buy any other fleece blanket again! This blanket looks amazingly soft! I’d love to use this on my bed to keep us warm at night. I would love to own one of these blankets! They look so comfy and lush! Really love the rich chocolate brown color! These blankets look so soft and comfy. There is nothing more comforting than to wrap yourself up in something that is so cuddly and warm. It does look so nice and soft! I also like that it’s made in the US – I like to support companies that drive our economy, rather than Hong Kong’s. Great review. We need a new blanket and I love the fact that it is safe for the washer and dryer. I am glad that there are so many colors to choose from and I have always loved the feel of fleece. This blanket looks so beautiful and sounds so comfy! I’d love to have one. The current blanket I’m using, no matter how much I’ve washed it, etc., just hasn’t gotten soft! I have just recently heard of this company. This is just another great review of this blanket. I need a good blanket that will last years as all my other comforters are thin and wearing. This looks like a great replacement! This looks and sounds like a great blanket and a great company. nothing nicer than a soft blanket to cuddle up with. This looks like the type of blanket you’d want to wrap yourself up in when the day has been a long one or if you’re under the weather. The softness even show in the pictures and the colors all beautiful. These blankets look so soft and comfy. I’d love to cuddle up with one! Great review! These blankets look so warm and soft. Its been such a cold miserable winter, would love to try a new blanket like this. These look so soft and cuddly. I know the dogs would love to curl up with me and one of these! And so happy its American made!! I love fleece blankets. They are so soft and warm. I’m covered up in one right now. I’m thinking since I never quite got warm this winter that one of the Luster Loft blankets would do the trick for next year. I would like the King Sized Fleeet in Sea Mist Green would be a perfect choice. I have been a faithful purchaser of another type of blanket (whose brand name I shall not mention) for years, but the quality has fallen as of late. These Luster Loft Blankets appear to be an even better version of the blankets I used to so adore. If it were not for your review, I may never have heard about them. Thank you! We like to keep the house chilly and I love to have a fleece blanket in my lap when I’m sitting on the couch but never thought to get one big enough for the bed! I recently won one of these blankies and I love it so much. I got it from Still Blonde after all of these Years and now my husband has blankie envy! That is so funny! Lucky for me my husband is allergic to polyester so I am able to snuggle in this all by myself! I love to buy products made in the USA when ever I can. This blanket looks real warm. Love that these products are made in the US. They look so warm! Thanks for the review! I would love to have a new blanket mine are getting old so this is one i would for sure go buy. I really love the colors as well as the quality. I love that the blankets are made in the U.S. in Massachusetts. I love the california king in cotton ball blanket. Your review is very informative. I love that it is made in the USA and is very lightweight. It is very surprising but also very telling that it came in a very nice gift box. This tells me that they take pride in what they make. That is something that you don’t always find these days. I’ve been thinking about a new blanket for next winter – this one looks so soft! And the fact that it’s hand-made in the USA is a big plus. oooh I need to get one of these. I love that they’re made in a small company in a historic space, but really I’m dying to feel that super softness! I can not wait to get all wrapped up in one of these super wonderful blankets. They look so soft and inviting. Great pics-it looks amazing! I really want one in the Buxton Blue color. Glad to read that they don’t pill because I hate that. It has always been extremely difficult for me to find a quality, luxury blanket that will hold up. They are great when you first get them but after a couple of launderings they look and feel awful. These sound like they may actually stand the test of time. And, I love that they are made in America! THIS IS A VERY NICE REVIEW, AND I HOPE TO WIN ONE TO COVER MYSELF WHILE I ENTER GIVEAWAYS….NOW THAT SPRING IS HERE I MIGHT HAVE TO WAIT TILL WINTER AGAIN.. These blankets look so warm and cozy! I definitely need to look into these because I am always cold! I also love the fact that they are made in the USA! Thanks for the review! I would love a King size one in Sea Mist Green. How beautiful they look and sound like they are so cozy. I could tell from the pictures that these blankets would be plush. I’m kind of like you in that I sometimes don’t want to open the new blanket because I want it to stay in pristine condition and blankets always look so luxurious in the package. If I don’t win one of these, I’m definitely going to look into buying one. Great review. I read about the history of this blanket company and found it very interesting. I have one of their throws and it is the softest throw I have ever felt in my life. I would love to try one of these blankets and I’m sure I wouldn’t be disappointed. These blankets look so soft and comfy! I love the colors they offer and they are made in the USA, that’s a plus! I had a blanket that looked similar to this but wasnt quite the same…it was cheap and my cat ended up clawing through it. I tried sewing up the holes but it just wasnt the same afterwards. I would love to have a nice blanket again that I wouldnt have to worry about my cat clawing through it (not cheaply made) and that would actually keep me warm. As my old blanket was nice…it just wasnt up to snuff. I would love to watch tv and snuggle with the grandkids! This looks like heaven. Thank you for the review. I don’t see how this blanket could disappoint anyone. Warm and cuddly soft, just what we need while easing out of one of the coldest winters I can remember. I also love the fact that these blankets are made here in the U.S, providing jobs right here. i love that they’re made to last, i am so sick of buying new blankets every few years. these actually remind me of some that my grandmother had & i loved those. These blankets look like high quality blankets. The colors are versatile and would work with most color schemes in the bedroom. Those aren’t the best looking blankets. They are really soft and warm though. Comfort is most important. The blanket looks so soft and cozy! The bonus is that it’s made in the USA. I have wanted one of these for a very long time! They look like they would feel so soft and comfy. The fact that they are made in America is very impressive! I would love a Luster Loft Blanket. I can never have too many soft blankets. I always use one when I go to bed and also when sitting on the couch. These look so soft and I have to have a soft blanket to curl up in. Thanks for the review. I love blankets! I like that your blankets dont pill and the cost is reasonable. I like the color choices. There’s nothing better than snuggling up with a soft blanket to help you drift off into dreamland! I’m a sucker for a soft, warm blanket! Would love to win this, thanks for sharing this! I also love it’s made in the USA! These blankets would be great to have on a cold Chicago night. I would get several colors including Golden Dune and cotton ball. I think that these blankets are so pretty. I have never owned one myself but I have seen them in the stores and they feel so soft and seems to be fairly heavy enough to really keep you warm in the winter too. I just love the way they look on the bed! One of life’s pleasures is sleeping with a soft blanket. The cost of the blanket, though considered in my household, is sometimes budgeted for the nicer quality…softness, non-pilling, blanket. I love fleece blankets and this brand looks especially soft! I appreciate that it is made by an American brand and that it seems to be a reasonable price for the quality/size. I love all of the choices in color and would love to own one! Thanks for the review! I have been looking for a new blanket for my bed but I am really picky about the type of blanket I want. My bed is a place of comfort and peace and my blankets and sheets should be amazingly soft, comfortable and durable. The sheen of these blankets are what caught my eye but your review is what makes me want this blanket for my bed. The part that really convinced me is that it is guaranteed to stay as soft after it is washed and dried. These look like well made quality blankets. Being that they are made in the USA is an added plus. Enjoy your new cuddly blanket. First off having these made here in the USA is a huge plus for me. I love a soft fleece blanket but what makes yours special for me is the fact that there’s no pilling or shedding. I had a blanket that did this and it was awful. Your company seems like the best one to get what I want from a blanket. This blanket looks very warm and soft. I visited the American Blanket Company webpage and found these blankets come in some very beautiful colors–I like Golden Dune. My old fleece blanket is about on its last thread and I really need a new one. After sleeping with a fleece blanket, I would never choose any other type of blanket. This blanket looks like pure pleasure.Sine Im confined to bed a lot this would be pure pleasure in m life. To feel all that softness without a lot of weight..plus I love the colors. I really like these blankets. Overall, there is a good selection of colors and I really like the fact that they are made in the USA. Another good thing is that they are guaranteed for life and won’t shed or pill. They truly look amazing and incredibly comfortable! I love that they are made in America and I would love to own one. I can’t believe we spend 1/3 of our lives in bed. It sure doesn’t seem like it! Love to have a queen size blanket in Green or Black to match my bedroom. I am always looking to good soft bankets for my bed that I can wrap up in at night since my boyfriend keeps the cieing fan on thats over our bed. I get so cold. Those look like great quality blankets. I would like another one for my couch. I love that they make these in all bedding sizes, and the colors are so pretty. It would be perfect alone in the summer, or underneath our quilt in the winter! I looks SO soft! Thanks for the review! I like the Navaho white color. Would love to catch some Zzzzz’s all snuggled in. I have a soft blanket on my bed, but it’s not queen size and doesn’t fit. I love a soft blanket to cuddle in. I first fell in love with these blankets in better hotels and been a fan ever since. These blanket’s look so comfy and well made. Would love to cuddle up under one of them for a good night’s sleep. These blankets look so luxurious and are such pretty colors! This blanket looks so amazing and soft! It would be a perfect addition to my bedroom! Thanks so much for your review! I’m in love with this blanket and have not even seen it yet! I love the idea of it being the softest blanket in the world 🙂 You have caught my attention for sure! These blankets look so soft, I’d love one for every bed in the house. I really like that they’re made in America and are machine washable too. Thanks for the review! I’ve been looking for a new blanket for my bed to use instead of a heavy duvet. This one looks amazingly comfortable!! I would love to win one of this beautiful blankets. I love the fact its made in the USA, perfect for cool New England nights and very soft and luxurious as well. Safe for the washer and dryer is also a big plus in my book! Wow! Beautifully made blanket. Super soft and extremely cuddly friendly! Cold nights are no longer are a problem when you have a Luster fleece blanket! The only problem you’ll have is keeping other people from taking it! So you better get one for everyone in your family! Beautifully made blanket. Super soft and extremely cuddly friendly! Cold nights are no longer are a problem when you have a Luster fleece blanket! The only problem you’ll have is keeping other people from taking it! So you better get one for everyone in your family! This blanket looks soooo cozy! It reminds me of this super soft blanket I completely wore out but the company discontinued them. I must get one of these! Such a gorgeous blanket. I could just crawl right in there and take a nap! I love the creamy color you chose too and the price is awesome. Definitely one I need to get for my bed! One of my decorating goals has been to make our bedroom more inviting and cozy feeling too, with most of the focus on the bedding. This blanket would be amazing! Thanks for the review! Love the fact they are hand crafted. They look so soft and I love soft blankets at night to keep warm. That does look cozy! It may be spring by the calender, but going by the weather I could certainly use a nice blanket to warm up with. These blankets look so soft; and I love the colors! I love Golden Dune! First thing I like is that it is made in the USA! I am sure it is of the highest quality and looks so soft! It’s good to hear about a high quality American made product. They look wonderfully soft, it’d be great to have one on the bed this winter. I’m a sucker for pretty packaging too! This blanket looks perfect for cuddling on windy days like this! These would be great Christmas gifts! I had to wait for my blanket almost 3 weeks, and when I got it there was a rip the blanket, and they wouldn’t let me return the blanket. Bad company and bad material for this blanket.